Image caption The incident at Rochester Prison was "quickly resolved"
Two inmates at a prison in Kent gained access to a building roof. A spokesman for the Ministry of Justice said the incident at HMP Rochester was "quickly resolved and there was no impact on the prison regime". 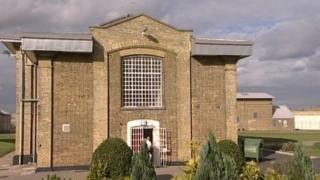 Prison visits also continued as normal, and inmates had their regular weekend time outside their cells. Earlier reports had suggested the two prisoners were on the chapel roof and were removing roof tiles and throwing them, but this has not been confirmed. Rochester Prison houses young offenders and adult Category C offenders.